Welcome to this edition, in this edition the topic is construction of a fibreglass fuselage. This column contains plug making, mould making and laying up fuselages from a mould. The ability to construct your own composite fuselages allows modeling to become more affordable and this column is intended to be used a reference only. Making components from composites has inbuilt risk, you need an open area to deal with fumes and gloves and other items help prevent epoxy contamination. The resins used in these techniques are not good for human health, be careful. To construct moulds for the construction of a fiberglass fuselage you will first need to make two plugs, one for each side of the fuselage. The way that plugs are constructed is to make a male form to be used in the construction of plugs. To construct a male form you can either cut an existing fuselage in half (seriously) along the join line of the fuselage or the second option is to construct you own fuselage to be used as a male form. All voids in male forms must be filled, so the rudder attachment point and the fuselage front must be blanked to prevent epoxy seaping and ruining your plugs. To make nose cone plugs you will also have to cut the slip on nose cone in half to be used as a plug and the rear now semi circle area has to also be blanked to make a usable plug. When making your own male forms traditional construction techniques work well, the plug does not fly, so other heavier and cheaper woods can be used. For design a plan could be drawn and the design constructed using traditional techniques. The fuselage constructed for the plug must be sealed so the molds can be layed up successfully without attaching to the male form.Painting and varnashing will seal your wooden male forms, you are trying to stop the mould release soaking into the structure preventing release of the moulds. When finished, you can then cut your own design in half to allow for male forms to be used in constructing a plug. Marking out the center line in the male form for the plug is critical; as is the ability to make a long, straight narrow cut when cutting your new male form in half. When you have your male forms the next job is to purchase two pieces of glass for the construction of the plug. You will need to attach each half of the fuselage male form to the glass, epoxy is best used for attachment. When gluing your form to the glass it is critical the join is sealed, that the plugs are “flat” with no gaps, sanding with long flat sanding blocks may be necessary for a perfect join when glued to the glass. Wiping the excess resin with methylated spirits and a rag will deal with the seap, the inside does not matter. Alignment is critical when making plugs, you will need to mark and measure the fuselage halves; so that they are in exactly the same spot on the two halves of glass. To align, marking out is critical, the fuselages attached to the glass need to be in alignment with an error of less than half a millimeter. With your fuselage attached to the glass, and in alignment your plug in now finished. When making plugs, the fuselage half must not have any excess epoxy on the outer join to the glass; as the join to the glass must be as neat as possible; it helps with producing good quality moulds. This removal of excess resin on the outer produces a neat join in the layed up fuselage. Also necessary for the proper alignment of the moulds is a reference line on the plug, permanent textas are fine, or you can scribe into the glass. This is to allow the moulds to be aligned after they are layed up over the plug. The reference line needs to be on two common points front and back, so the center of the tail and the center of the nose and ruled straight to the end of the glass, front and back. This task is critical it is how you align the mould, and the end of each piece of glass is also a reference point. Glass is ideal for plug making, it is flat, hard to twist and the moulds release easily from the shiny surface. The next job is mould construction. The first task is to apply mould release to the plug, if the mold does not release from the plug the plug will be destroyed and your chance of making any more moulds from the plugs is over. There is a PVA based mold release that could be used but it require an air brush to spray the release agent. In most cases waxing is the best option and composite suppliers are useful to purchase mould release agents. The next job is to lay up the moulds, you will need to lay up first two layers of finishing cloth over the entire plug and the composite used can either be polyester or epoxy there in no need to save weight when making moulds so use more resin rather than less, especially on the finishing cloth it helps produce better surfaced molds. I recommend that you use polyester resin as it dries quicker and gelcoat can be used to make the moulds coloured which helps when laying up fuselages. The next composite layed up is two to three layers of 8 oz woven cloth. Over the top of this cloth is chop strand matt, this is cheap cloth used in the construction of Kayaks. With the use of chop strand mat it is easy to lay up and it is the cheapest cloth. It is used over the other cloths to prevent the mould from twisting and bowing, you need to give the mould structure. You will now need to let the moulds dry, longer is better. When the moulds are dry you need to release the moulds from the plugs. With the moulds dry and released the next job is to align the moulds with each other. The reference lines mentioned earlier will allow the moulds to be aligned and then you will need each half of the female form to be in perfect alignment. The female forms need to be aligned otherwise you will not have perfectly aligned fuselage halves and the fuselage will be out of line and unusable. With the two mould halves clamped in alignment with g-clamps, it is now time to drill holes in the aligned mould, for bolts that will clamp the moulds together to make fuselages. Bolts will need to be purchased to clamp the two halves together, hardware store bolts are fine for clamping bolts. With the moulds aligned the next job is drill the holes, every twenty centimeters around the perimeter there needs to be a hole. Bolt the two halves together and tidy up the edges on the mould around the outside, this is done with an angle grinder, you are trying to make the outside of the moulds into a neat rectangle. Fuselages could still be layed up in non neatened moulds, but the composites can cause injury when they are not neat, this is a safety issue as well as constructional. The final task is to screw wood to the perimeter of the outside of the mould, MDF fibreboard is useful or chip board could be used. This is to allow the moulds to sit flat and raised when laying up fuselages and to recess these screws so the moulds sit flat, in alignment. 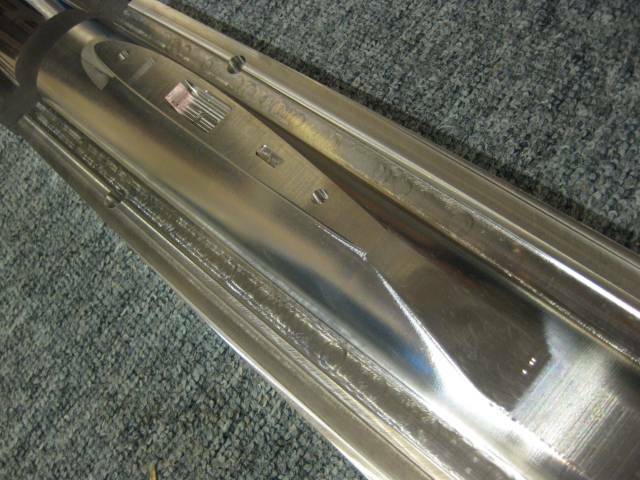 To construct fuselages from these molds you will need to complete these tasks. First is to polish the molds, car cutting agents helps to polish molds and with a gloss surface your fuselages will have a similar surface when complete. Next job is to “wax” the molds with mold release so the fuselage will release from the mold. To lay up the fuselage, I recommend epoxy resin it has more working time. You need to cut the cloth over size for the fuselage halves and choose your lay up. I recommend the use of finishing cloth, followed by 8oz woven cloth and then Kevlar tape along the tail boom. With the composites cut to size, templates help with this task. You will need to weigh the cloth, this is to allow for an appropriate amount of resin to be mixed. Generally the weight of the resin should be the same weight of the cloth, but 20% more resin than the weight of the cloth will guarantee a “wet” lay up. Place the finishing cloth in each fuselage cloth dry, and then put the 8 oz cloth over the finishing cloth dry. With both cloths aligned, with an overlap, you need to apply the resin. A “dabbing” motion is better than brushing and you want a wet lay up and also lay up the overlap. With the cloth wetted out the final task is to apply Kevlar, lay the Kevlar in place down the boom and wet out. In an ideal world we would then vaccum bag the fuselage into the molds for each half, however this is not necessary. To join the fuselage halves you need to wait until the layed up fuselage begins to go off, the resin begins to dry. You can access the state of the fuselage resin by checking the left over resin pot used in the initial layup, checking by hand will tell you when your resin is beginning to go off and you want a “rubbery” feel, just soft, before joining. Apply fresh resin around the overlap provided in your two halves when laying up. Next bolt the two halves of the molds together and tighten the bolts tight and lay the molds flat, you are trying to get the joining epoxy to spread and allow the fuselage to dry. By waiting until your fuselage is beginning to harden it allows for the two halves to be joined without “falling” out of the mold. Leave your layed up fuselage to dry. The final part of construction is to open the molds, cut the “excess” cloth from the fuselage outer, a dremel cut off wheel could be used. Then sand the join, or if cut perfectly you will then have a small join area along the center of the fuselage and you can now paint the fuselage and it is complete. There are other methods of laying up fuselages, you can pre paint moulds before laying up fuselages and when removed from the moulds the fuselage is painted and different cloths and composites can also be used. When laying up fuselages you need a wet lay up it produces a better, neater fuselage because the excess resin prevents pinholes and other imperfections. When making plugs accuracy is critical for good quality models, and making male forms in a group will help with quality in the design stages. Release agents are very important when making moulds for fuselages. You must clean everything when constructing fuselages using these techniques, any imperfections will show up in the completed product. Making male forms is difficult, however CNC cut male forms for plug making cost thousands, the techniques described allow for construction of affordable fuselages. Motivational material, CNC Milled F3B Race Machine male forms for construction of moulds. Race Machine male forms for the rear fuselage.